ASP was invited by Archdiocese of Manila Office for Persons with Disabilities Ministries (AMO-PDM) last December 05, 2010 to celebrate Persons with Disabilities Day or PWD Day at at Don Bosco Technical Institute, Makati City. In line with theme, “Walk and Pray with the Lord,” AMO-PDM’s Social Service Ministry provided pre-Christmas activities for friends with special needs. Rev. Fr. Alexander O. Thomas made a short inspirational talk for the formal opening of the program. To celebrating the Birth of Jesus, a Holy Communion was held. To show Love and Gratitude, a Fun Walk, was followed by Medical Mission and Party Activities for the children. 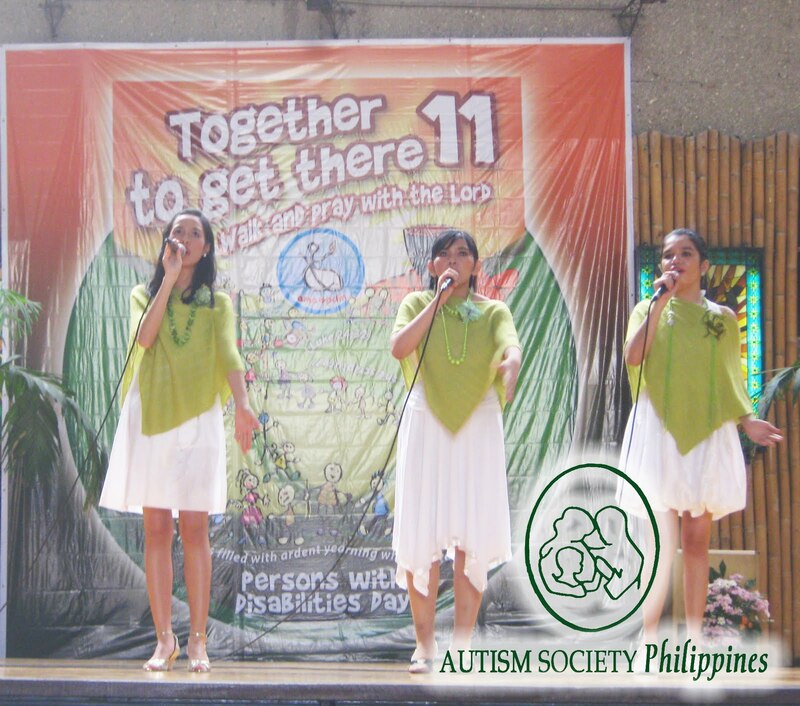 ASP Dream Girls: Nica, Velle and Thara as they sang "Angels Brought Me Here " with powerful voices. 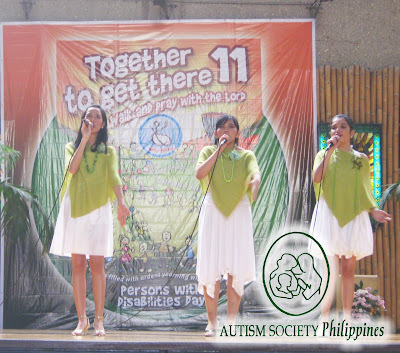 One of ASP’s most requested performers, The ASP Dream Girls, added Christmas cheer to the event when they sang “Angels Brought Me Here.” They also gave solo performances inspired by their singing idol divas: Thara sang the traditional “O Holy Night,” (Mariah Carey); followed by Nica;s powerful rendition of “I Will Always Love You” (Whitney Houston); and Vell’s heart wrenching, “Note to God” (Charice Pempengco). ASP Dream Girls at the side stage together with they're Voice Coach, Teacher Ging Viado. The girls quickly gained fans as they sang with such passion that kept audiences entertained. The fans were greatly encouraged with the trio’s messages of hope for families dealing with autism and other special needs. We would like to thank AMO-PDM for their yearly endeavor in spreading good cheer and kindness. Maraming Salamat and Maligayang Pasko sa Inyong Lahat!